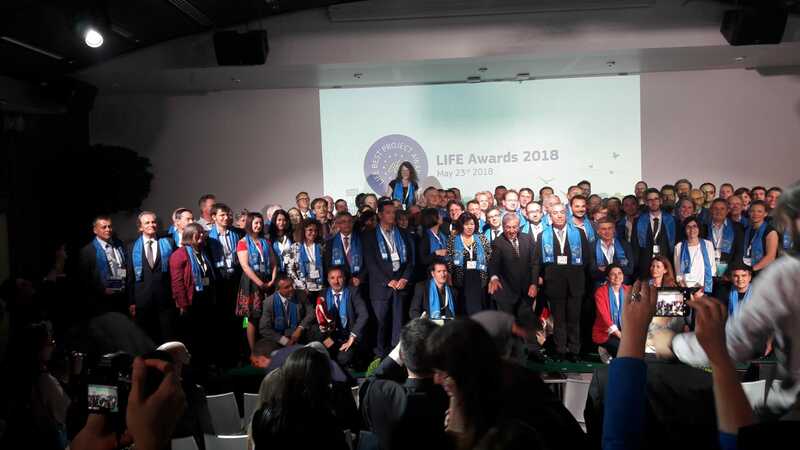 The mayor of Vilafranca del Penedès, Pere Regull, accompanied by the Councillor for Territory, Urban Services and the Environment, Josep M. Martí, received in Brussels the Best LIFE award within the category of Climate Action for the project of the Penedès, led by the City Council of Vilafranca, VINEYARDS4HEAT. There have been a total of 62 European projects distinguished among 430 submitted projects, all the finished in 2016 and 2017. VINEYARDS4HEAT is a local strategy to mitigate climate change and is based on the transformation of the energy contained in the local resource of solid biomass, the biomass resulting from the pruning of the vine, to obtain heat and cooling energy (thermal energy). Currently, this project led by the City Council of Vilafranca and in which Nou Verd, Innovi and Covides participate, gives service to some wineries and to the area of public facilities of La Girada in Vilafranca del Penedès.